Guess what?! 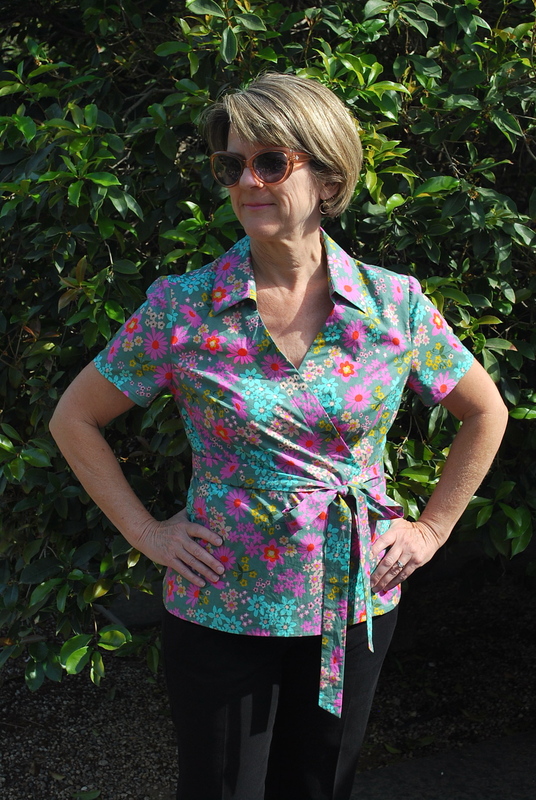 I’m a contestant on the Super Online Sewing Match II! I want to thank Beth and Kristin of Sew Mama Sew for selecting me as one of the ten contestants. It is truly an honor and a big surprise. 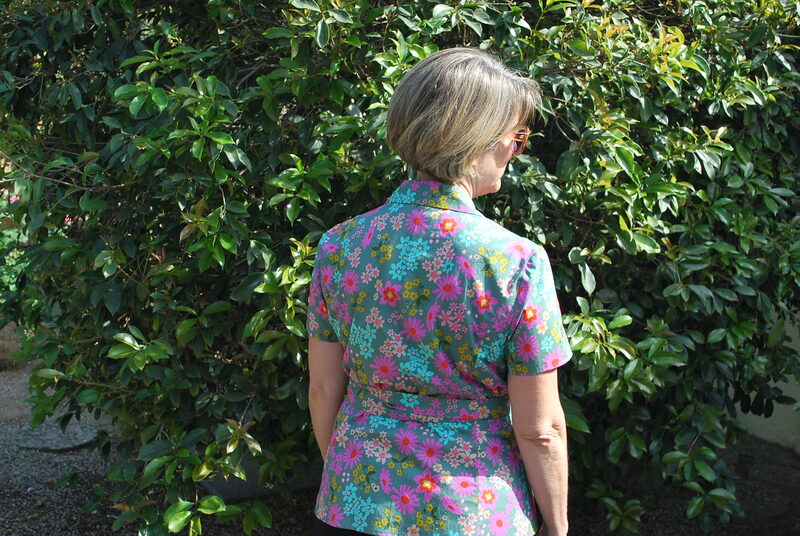 So, here in this post, I present Challenge #1, the Sutton Blouse by True Bias. 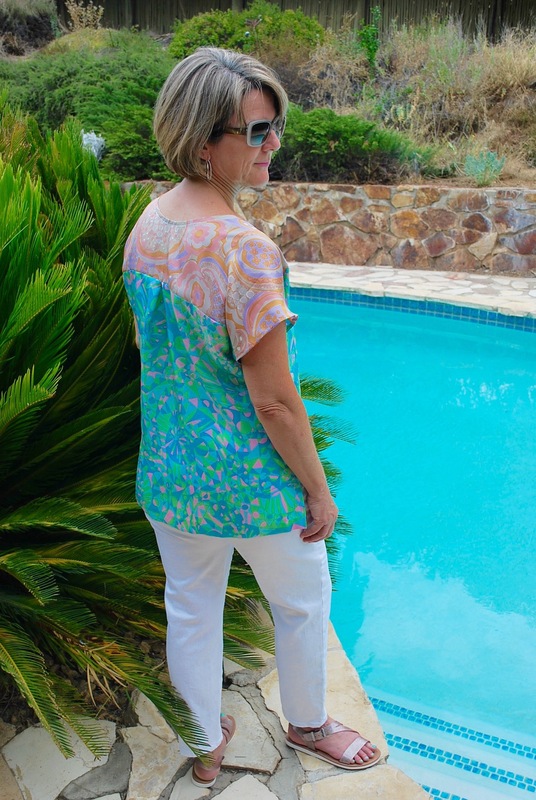 As soon as the Sutton Blouse was revealed as the challenge pattern, I knew my inspiration would be my new pair of white jeans. These jeans are a big deal for me. I’m stepping out of my comfort zone. I have never had a pair of white jeans nor did I think I ever would buy some. I didn’t think my white pants wearing would go beyond the ones I made for my Good Life Shirt. But then my children’s third grade teacher, and now Facebook friend, extolled the virtues of white pants to me and insisted I should have them as a summer staple. I opened my mind to this idea, and found a great fitting pair at Talbots. 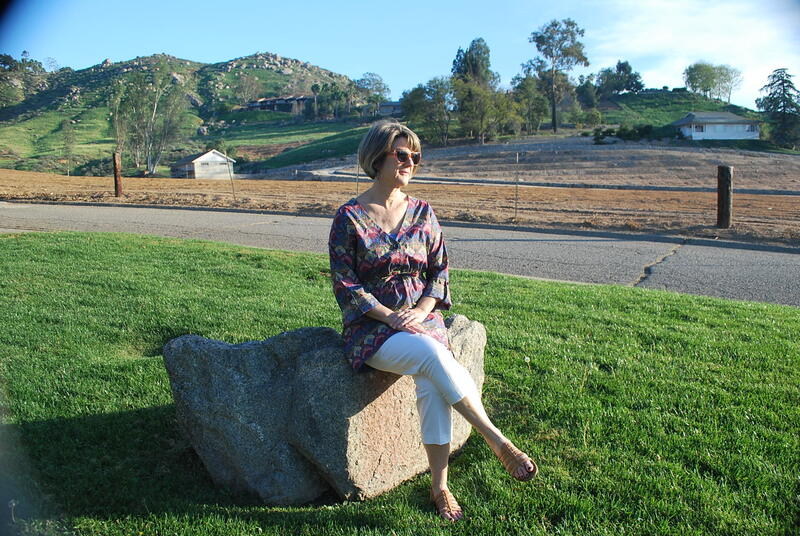 I instantly decided I wanted my soon-to-made Sutton and my new jeans to create a fresh, new summer outfit. I received this first challenge on Wednesday morning during my busiest “work” week of the summer. 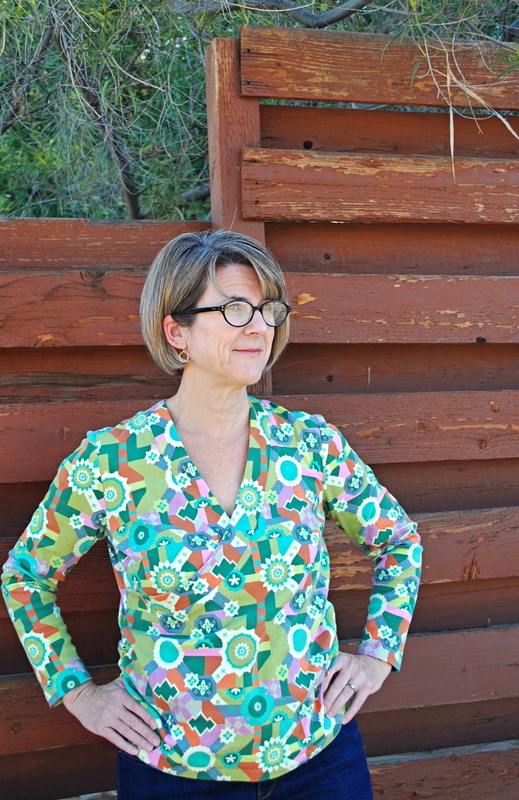 I was co-director of a morning puppet camp and director of an afternoon sewing camp for kids. The project was due the following Tuesday. 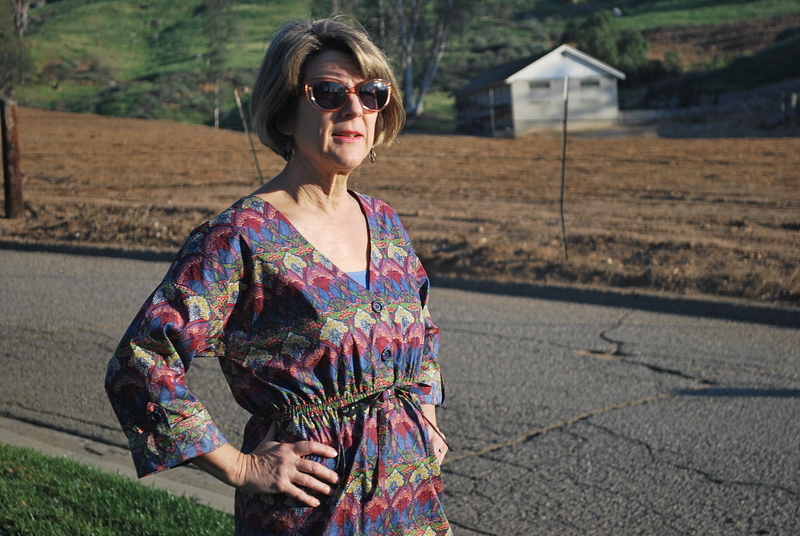 If I had not been tied down, I would have high tailed it into Los Angeles, 60 miles from my home, to buy fabric. So, appreciatively, I took advantage of the offer from Harts Fabric online store. Harts’ customer service was fantastic. After placing my order, they called me up the next morning, while I was at my camp, to deliver the unfortunate news that they only had one yard left of the fabric I had ordered. 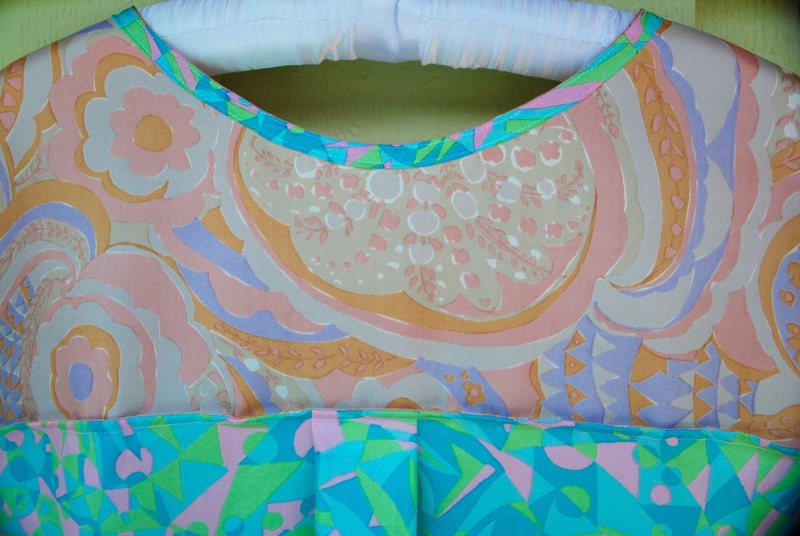 I quickly made a second choice so the fabric would still ship Thursday afternoon with an arrival date of Saturday. I did have some concerns about drape, as I switched from a rayon to a cotton voile. 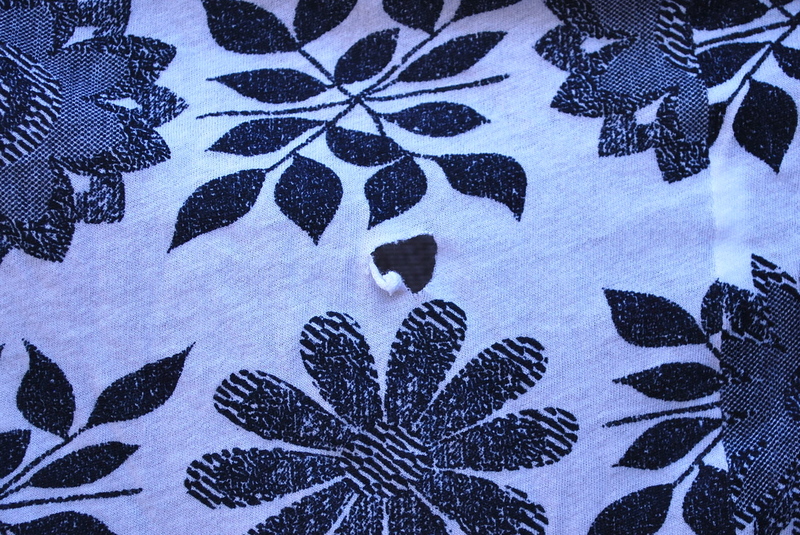 But I thought the print would be suitable for the center front seam on the pattern. I ordered a contrasting solid voile for the yoke. 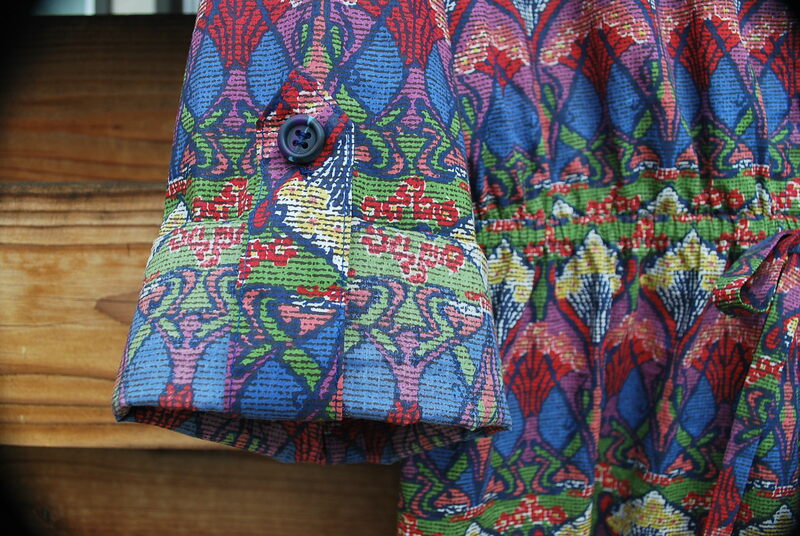 Saturday arrives, and so does my fabric. I am free all weekend to sew. No muslin for me. I’m diving right in. I never make muslins. Only on my wedding dress, my daughter’s prom dress, and my cousin’s daughter’s Irish dance dress. Come Sunday morning, after about my fourth try-on, when all was finished but the hem, I had to finally confront the fact that the line that was created by the contrasting solid yoke fabric, in combination with stiffness of the voile, made me look like a linebacker. The sleeves stuck out straight. I stopped and took the dog for a walk. While I was on my walk, I made the decision that I must start over. I couldn’t submit something I didn’t feel good about. Afterall, this was my time to shine! OK, there’s something I haven’t told you, but now is the time. Back to Thursday evening – while my fabric from Harts was in transit, I was looking through my closet for trims to use at my sewing camp. In a bag, I stumbled upon two pieces of mystery silk, meaning I had no recollection of how they came into my possession or that I even had them. I assume they came from my mom, because she will often accept sewing stuff from her friends who are cleaning out their closets, thinking I might be interested in them. Each piece was about two yards. 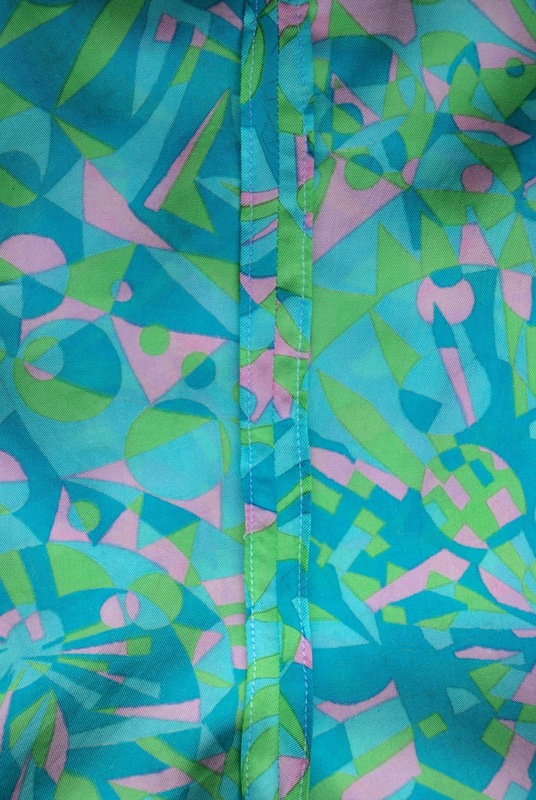 This vintage silk was kind of retro hip and grandma-ish at the same time. I immediately thought, wow, combining these fabrics together would make a unique Sutton. 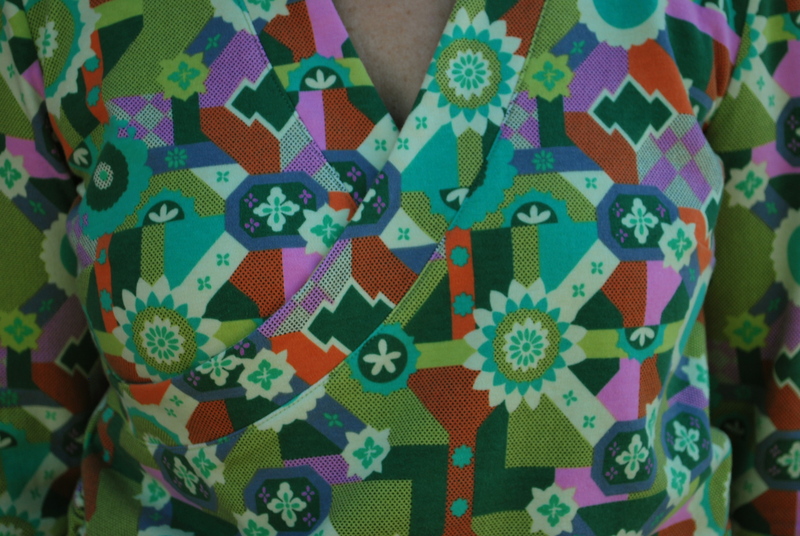 But my Harts fabric was on the way, and I felt obligated to use it. So I suppressed any more thoughts about the silk. Let’s return to Sunday morning. What I really decided was, not only was I starting over, I was going to use the mystery silk! Call it fate or some sort of a Devine intervention I found that silk when I did. It was meant for my Sutton! I knew sewing on silk would be a challenge, but it would give me the drape for the fit I desired. I sewed slowly, and did a lot of hand basting. Since this was a contest, I followed the instructions exactly including all of the seam finishes. This is something I don’t normally do. Just like you, I have my own way of doing things. I am happy to say, I found these instructions easy to follow, the clearest of any indie pattern I have tried so far. Thank you, True Bias! The only thing I changed was the hem. I did this by hand because the the silk did not lend itself well to machine hemming. After carefully hand basting the sleeve hem, I did the 1/4″ machine hem, and it ruffled the fabric. I actually ended up turning it in one more time and doing a hand hem. Having done this, I knew I would hand hem the bottom, also. 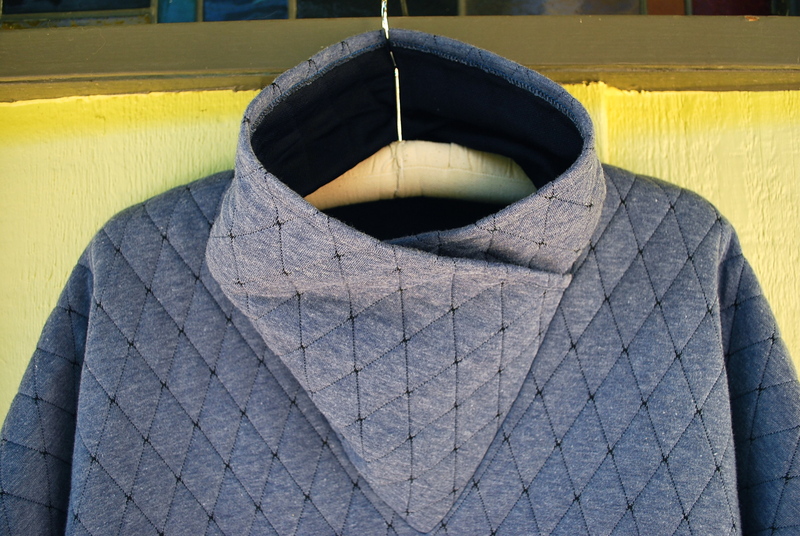 The neck has a bias tape finish that is done before sewing the front seam together. 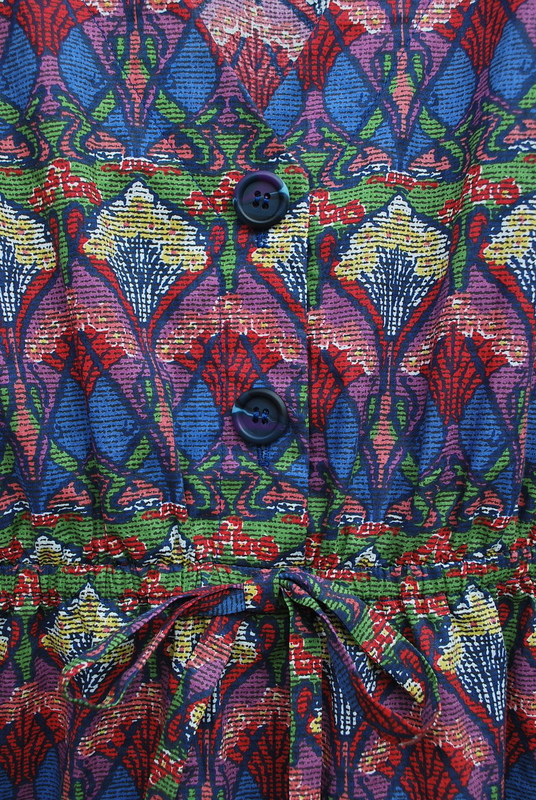 The front center seam and yoke seams are constructed as french seams. 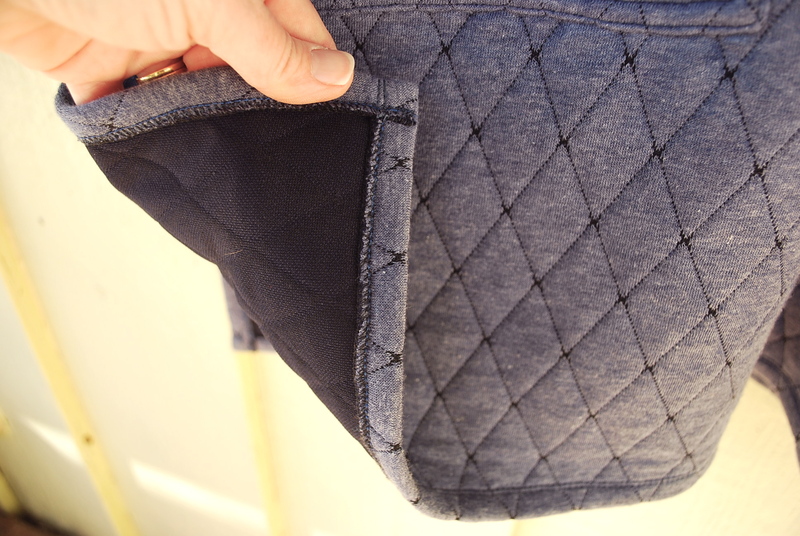 The side seams are finished by serging the edge, ironing under, and stitching. 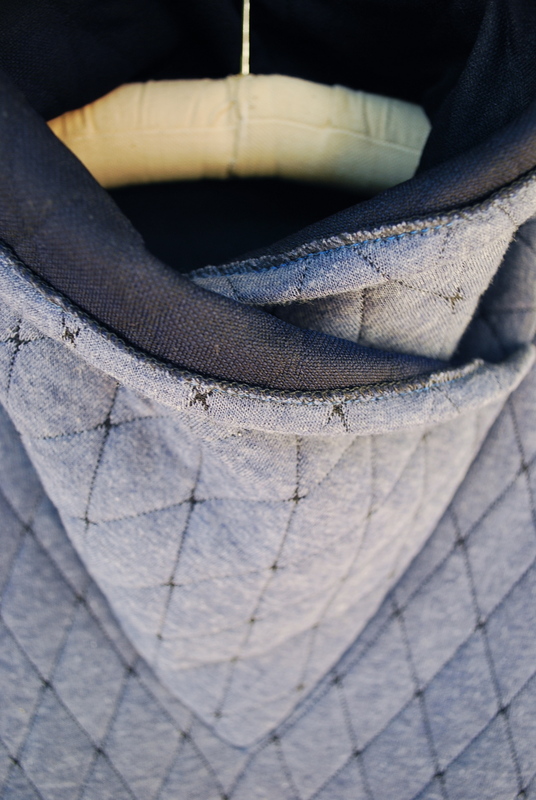 Then the seam is stitched at 3/8″. A french seam cannot be done here as the seam allowances must be kept separate for the slit at the bottom and for ease of construction at the underarm. There is a high-low hem with a slit. I cut a straight size 6. 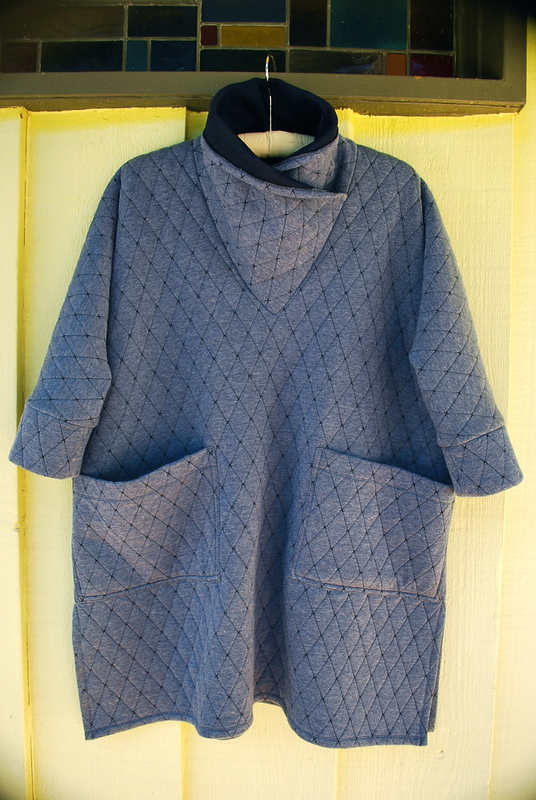 The only alteration I made was shortening the length on the pattern pieces by 3/4″. I am very pleased with the fit. 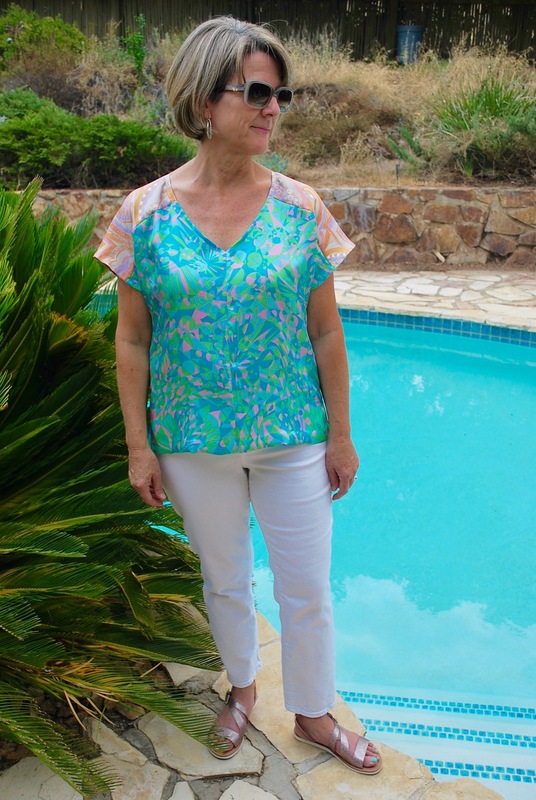 During Round One of the Super Online Sewing Match, I have: tried a pattern that I never would have otherwise, sewed up some silk that probably would have yellowed in it’s bag, made a perfect top for my new white jeans, and connected with some super gals in the online sewing community. Harts Fabrics, you are awesome. And the fabrics you sent me were awesome too, just not right for my Sutton. I definitely will visit your store the next time I’m in Santa Cruz, which I hope will be soon! Just a quick post, without the usual details and close-ups, to share a basic make. 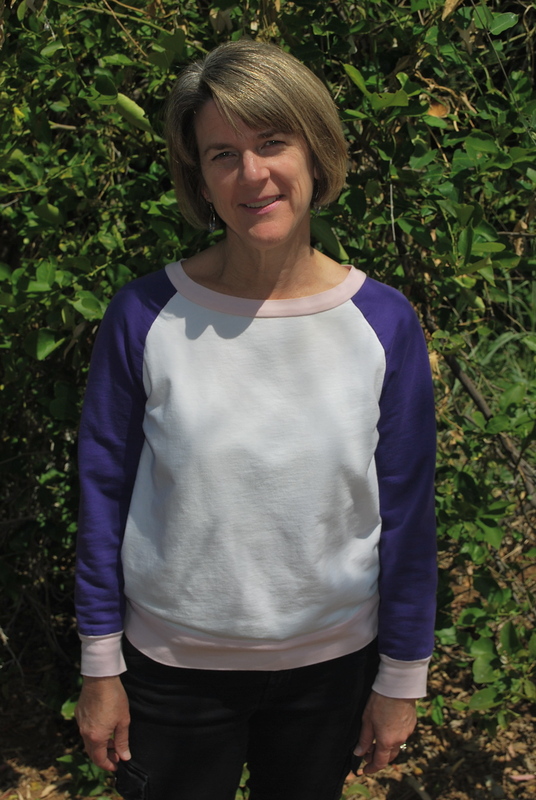 Several months ago I made this sweatshirt and it has become one of my favorite comfy grab-n-go basics. At this point, my sweatshirt has been through the washer and dryer several times. It is McCall’s 6992. I purchased it on sale at JoAnn’s for $1.40. I made view B, and cut a size 14 with no alterations except taking off 1 1/2″ from the sleeve length. My son was around while I was making this sweatshirt, and he told me that is was cool! How often does a 22 year-old young man comment on and like a garment his mother has made? Very rarely! “Would you like me to make you one?” I actually can’t remember his answer, but I ordered some fabric anyway thinking I would make him one for Christmas. Of course, I never got around to making it. Four months later, his birthday was two days away, I had no gift and a free Friday afternoon. So I whippped up a sweatshirt from New Look 6321. Modeling his birthday gift at grandma and grandpa’s. 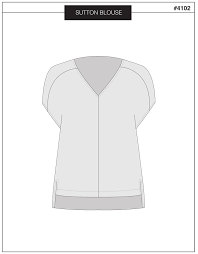 This is a unisex pattern. My son is quite slender, so I cut a Medium. 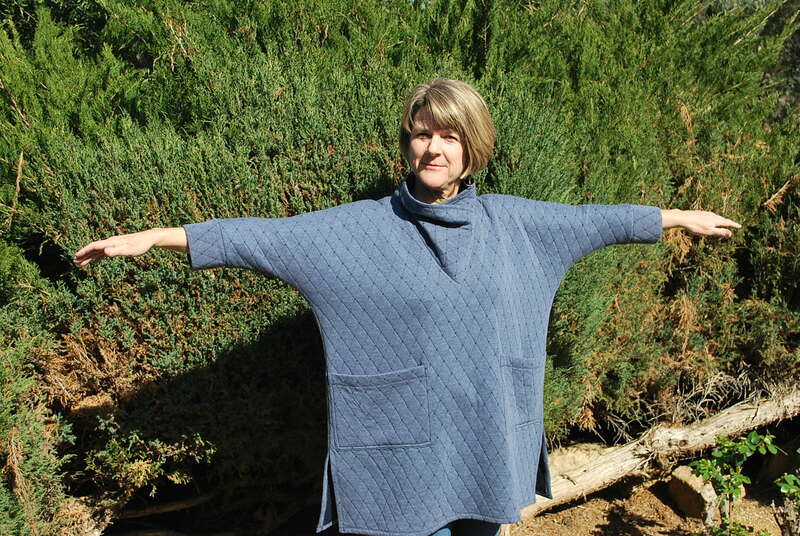 I made View B and added ribbing to the sleeves and bottom. The only alteration I made was a gradual narrowing the sleeve to subtract 2″ off the bottom circumference before adding the cuff. The fabric for both shirts is 100% organic cotton which I purchased online at Fabric.com. I am not actually a big fan of this site. Their shipping is always slow. But I like this sweatshirt fleece. It is super soft and reasonably priced for an organic knit at $10.98 per yard. However, I wish the color selection was larger. I would order more! It would be nice to have a picture of us together wearing our sweatshirts, but the post would be delayed several weeks waiting for the opportunity for that to happen! 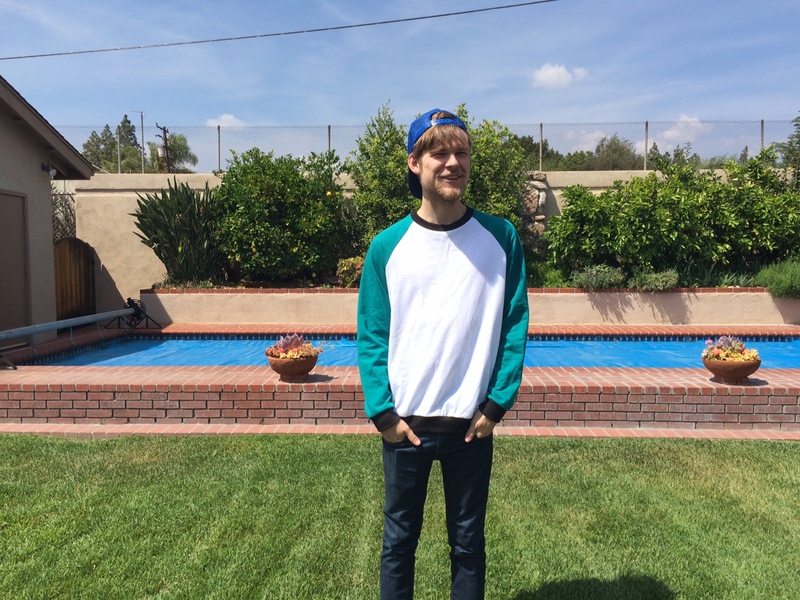 Upon his most recent visit home, I ask my son if he had worn his sweatshirt. He said yes, he wore it to the movies with friends. “Well, did you get a compliment?” I asked. “Yes. They thought is was cool.” “Did you tell them that your mom made it?” “Yes, and I told them you had a blog and were pretty big in the middle-aged sewing community.” Well, not all true…but thanks…I guess. Ok, I broke my New Year’s resolution and got behind on my blogging. Taxes and a wonderful spring break vacation got in the way. I am always envious of other seamstresses who, no matter what, are so prolific all the time. What is their secret? Boundless energy? Hyper disciplined? No day job? Anyway, I have been anxious to share Fresh Make #26 with you because I am so pleased with it turned out. 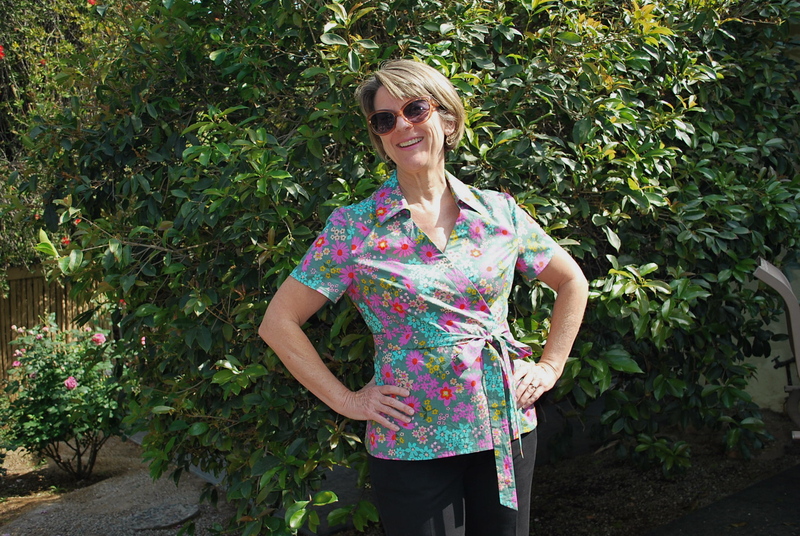 I have made a wrap blouse perfect for work or a fun spring event. 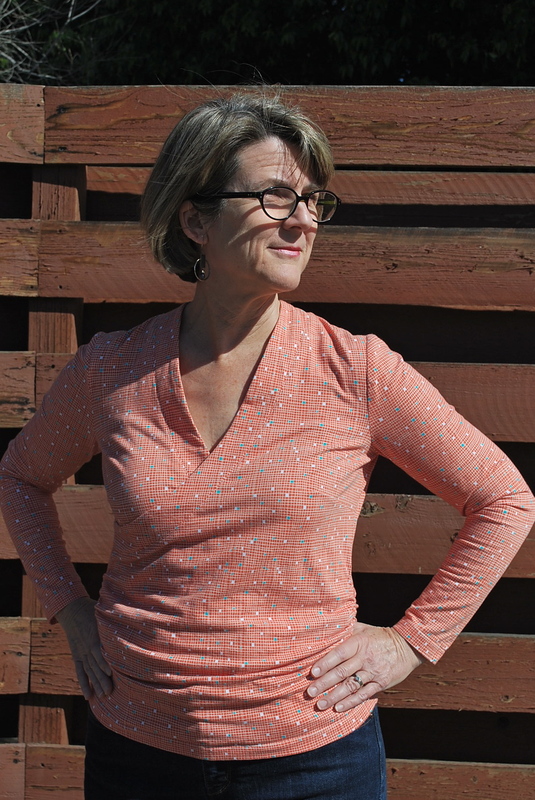 I was inspired to make another wrap top after my success with the second try of The Every Woman Top. 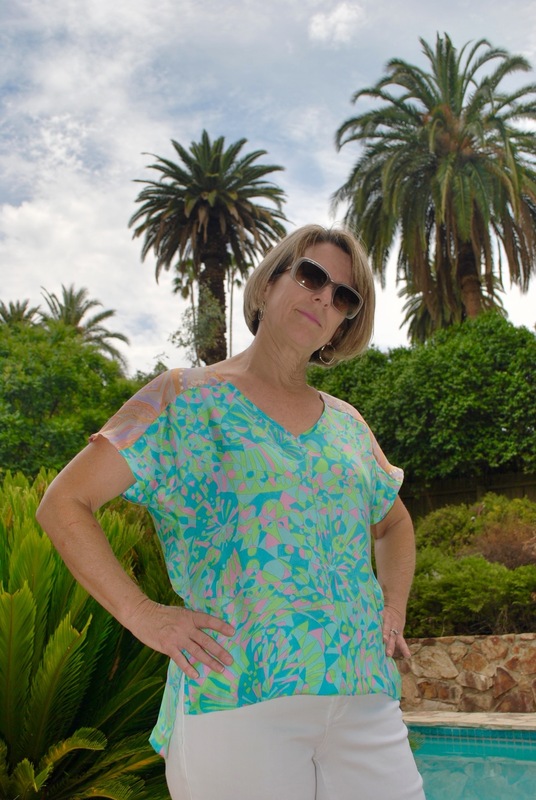 Unlike RTW, I discovered a custom made wrap top can actually look decent on me because I can adjust for my bust to hip ratio. 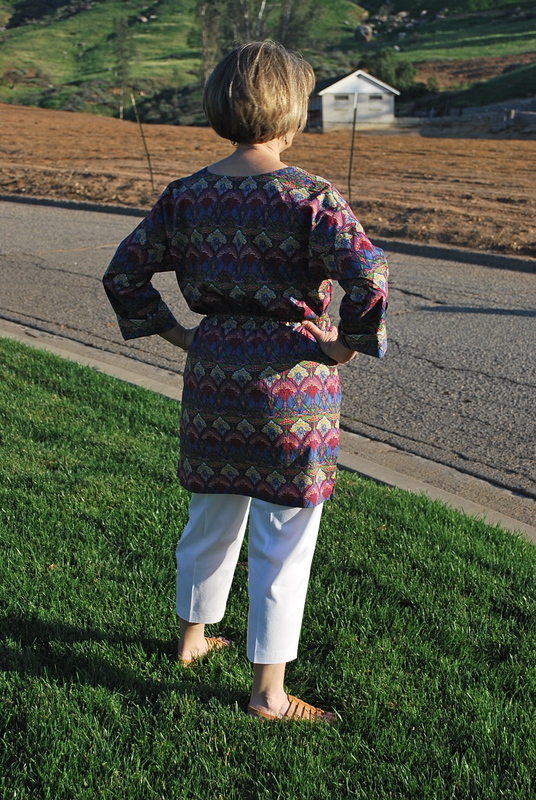 The pattern I used was Vogue 8833, which I purchased on sale at JoAnn’s for $4.99. (I always mark the sale dates for Vogue patterns on my calendar.) I choose this pattern because of my new enthusiasm for the wrap design and my constant need for verstile, causal professional wear. Additionally, I am a big fan of the patterns that have the A,B,C,D cup size options. The fabric, which I ordered online, more than met my expectations. It is a smooth, lovely lawn cotton from Hawthorne Threads. 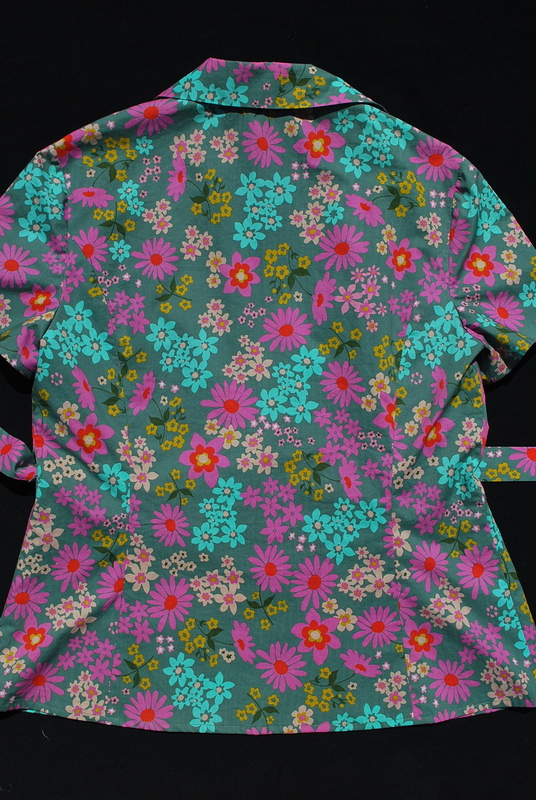 Here are the specifics: Melody Miller, Playful Lawn, Vintage Flora lawn in Aqua. I love the fresh, modern color palate. It also comes in a couple of other colorways. I purchased 2 1/2 yards at $13.95 per yard. It has princess seams both in both front and back which add to a flattering fit. There’s an opening in one of the princess seams for the tie to go through. I added a thread loop on the opposite side seam at the waistline to hold the tie in place. 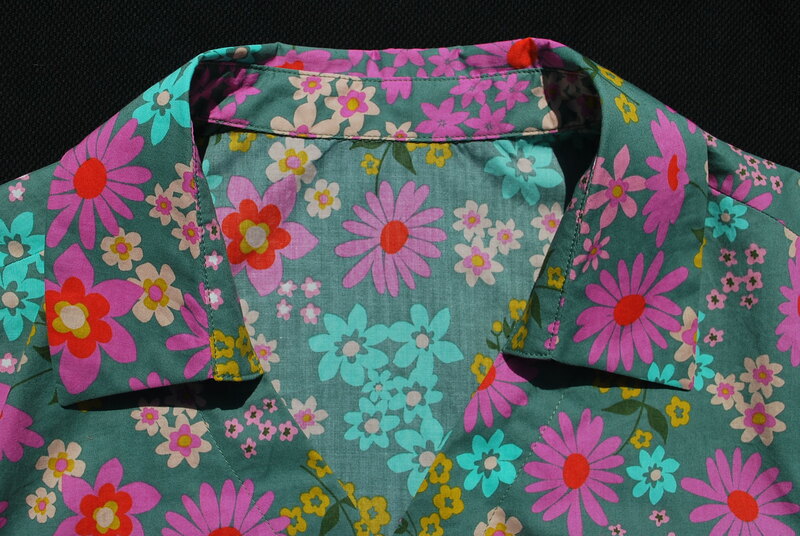 Because the lawn cotton sews up and irons so beautifully, I decided not to top-stitch the edge of the collar or facings. Here’s an inside peek so you can get a better idea of how it all goes together. 1. 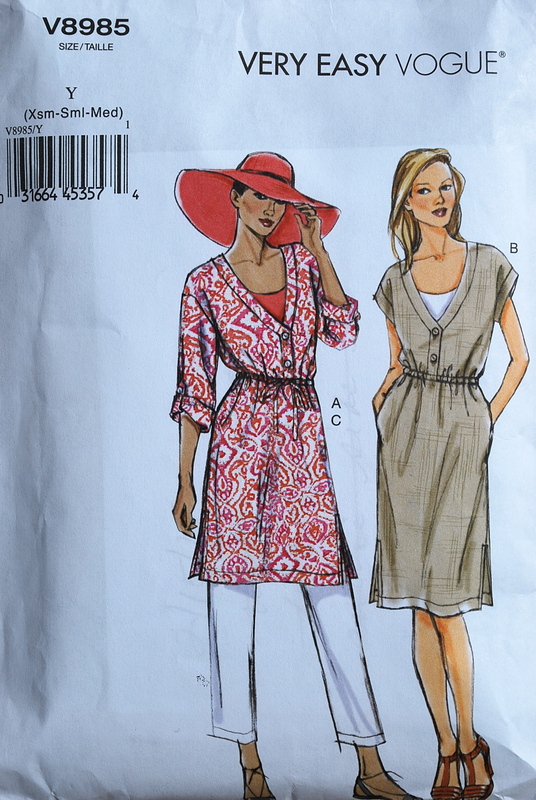 I think I say this everytime I make a Vogue pattern, but I feel I need to keep making this comment – this pattern is labeled “Easy.” I believe this rating is relative to other Vogue patterns, not sewing in general. 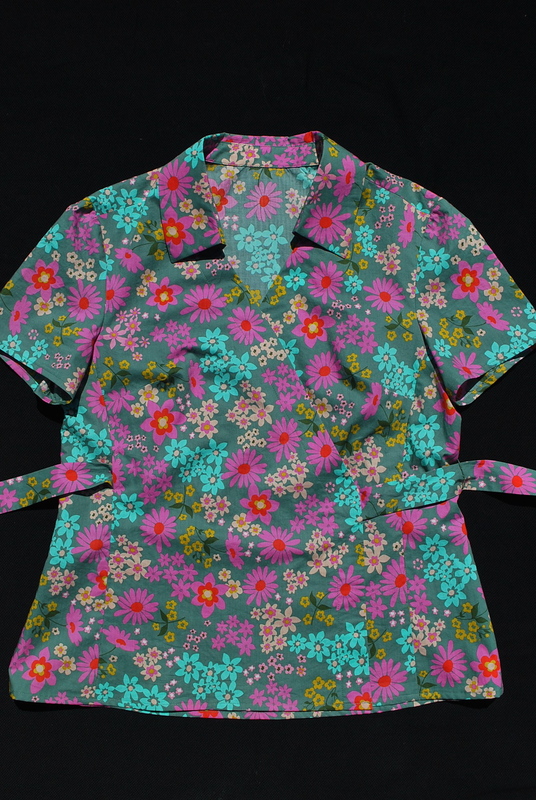 This pattern has a collar with a band, set-in sleeves, and some other features that wouldn’t be appropriate for a beginning seamstress to attempt independently. 2. I cut a Size 12 on top and graded to a Size 16 on the bottom. I choose the B cup option. Overall I was very pleased with the fit and did not make any adjustments after trying it on while sewing. 3. The only thing I added that wasn’t suggested in the instructions, was a thread loop at one side seam to hold the tie in place. 4. 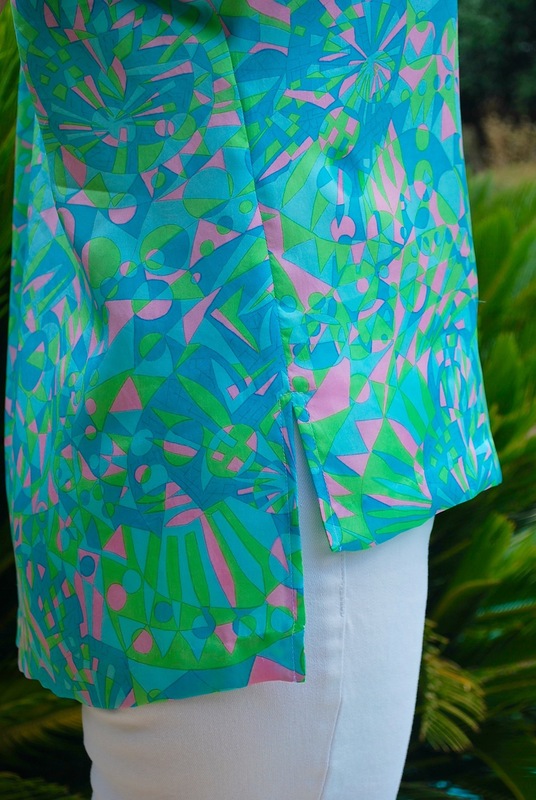 Honestly, I have nothing more to say about this pattern, except it sews up exactly like it looks. I am very happy with it. I truly think it would be great on all figure types. I’m just anxious to publish this post. 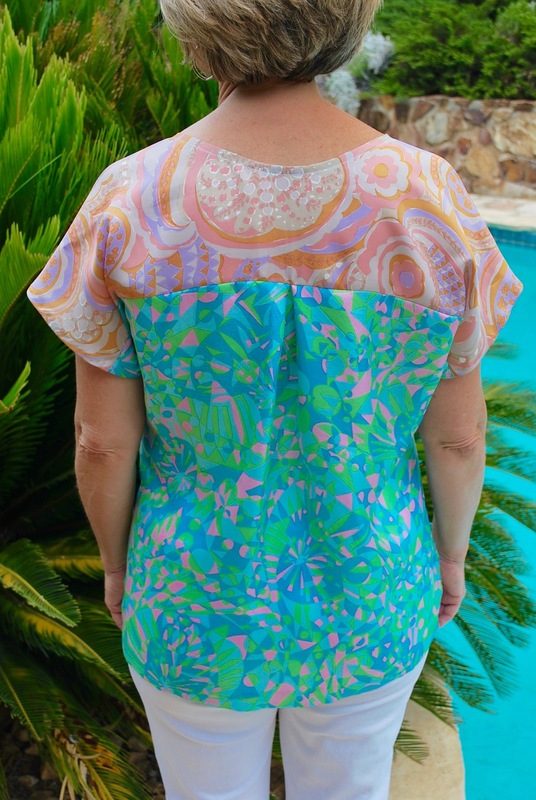 Even when I’m on a fabulous vacation, I miss sewing and blogging. I still look on Instagram and scan through other blogs to keep up on what others are doing. How about you? 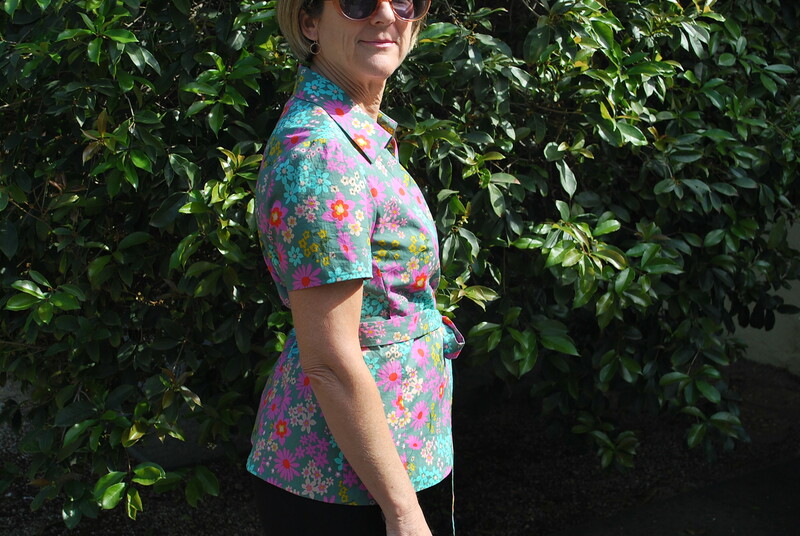 How do you feel when you don’t have time to sew….even when you’re having a fabulous time doing something else? 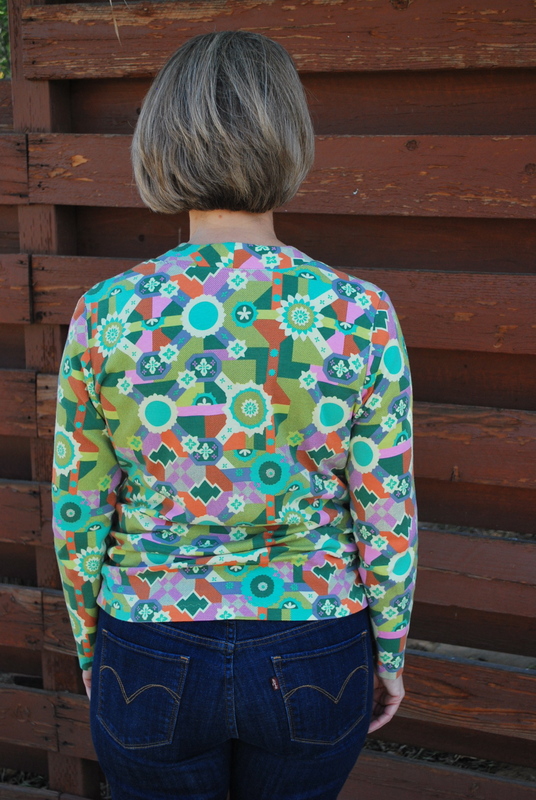 I have made 25 garments since starting this blog, and I have probably mentioned in most of my posts, “When I make this again, I’m going to…….” So how many have I actually made again? I will admit that 90%+ of my makes are one-time adventures. Mainly because with the limited time I have to sew, I find the most enjoyment out of trying a new pattern from my large pattern stash each time I make a garment. But there are two that I have been compelled to revisit, and I’m excited to share these Take Two makes with you. The first Take Two is The Jean Skirt, Fresh Make #1. Sometimes the garments that “wow” the least are the ones we grab the most because they are a great basic. 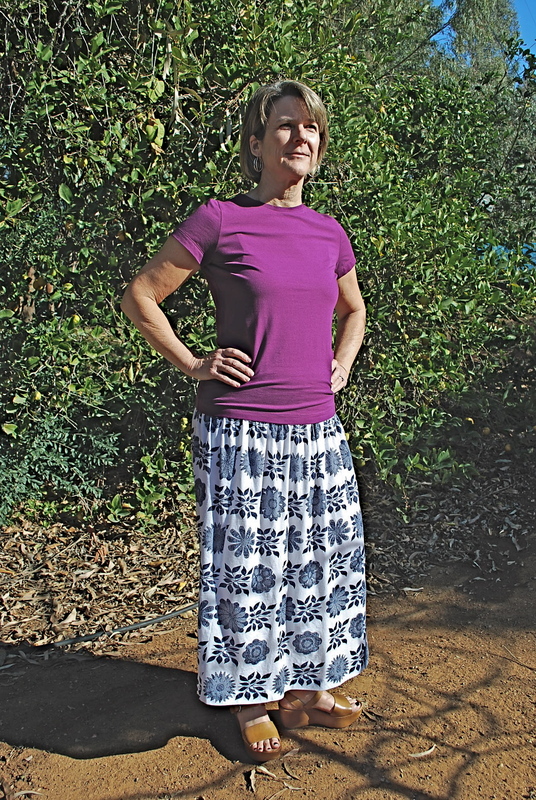 And that is the case with The Jean Skirt, Simplicity 1616. I really like how it fits, lays flat across the stomach, yet has plenty of width through the hips and thighs. AND it is quick and easy to make. I wanted to make another as soon as I finished the first and what finally spurred me into action was, sadly, I tore my first Jean Skirt. The fabric, which I ordered online, was disappointingly thin. While wearing it, it got caught on something, I don’t even remember what, and now it’s wadded up on the top shelf of my closet. I learned my lesson that you usually “get what you pay for.” So for Jean Skirt, Take Two I shelled out the big bucks for 2 3/4 yards at $14.50 per yard for Anna Marie Horner’s beautiful, thick, soft, interlock knit, Mary Thistle, in navy, from my favorite online fabric store, Hawthorne Threads. 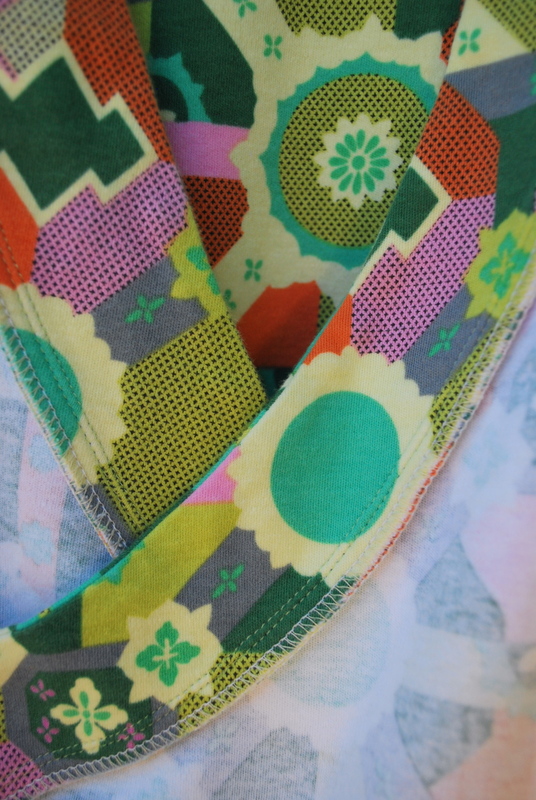 This fabric goes through the washer and dryer beautifully. 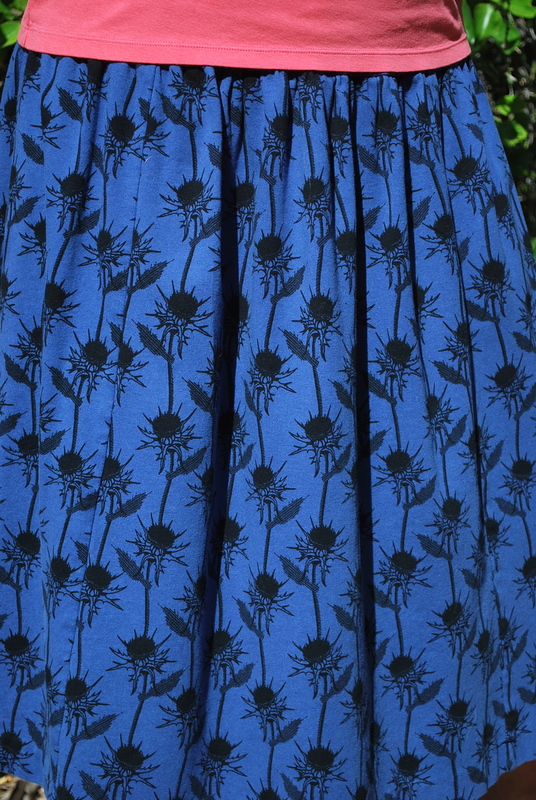 The dark blue with a black print acts like a neutral. You can really pair it with almost any color. A true grab and go skirt. 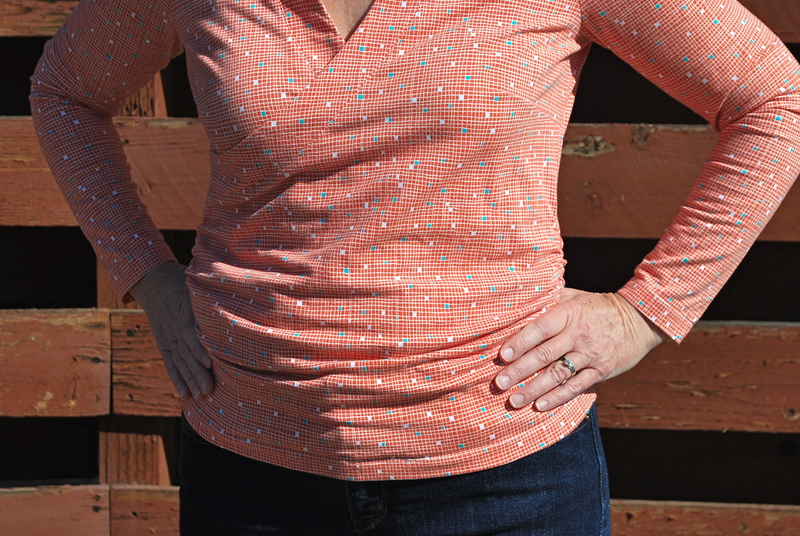 My second Take Two is The Every Woman Top, Fresh Make #21. 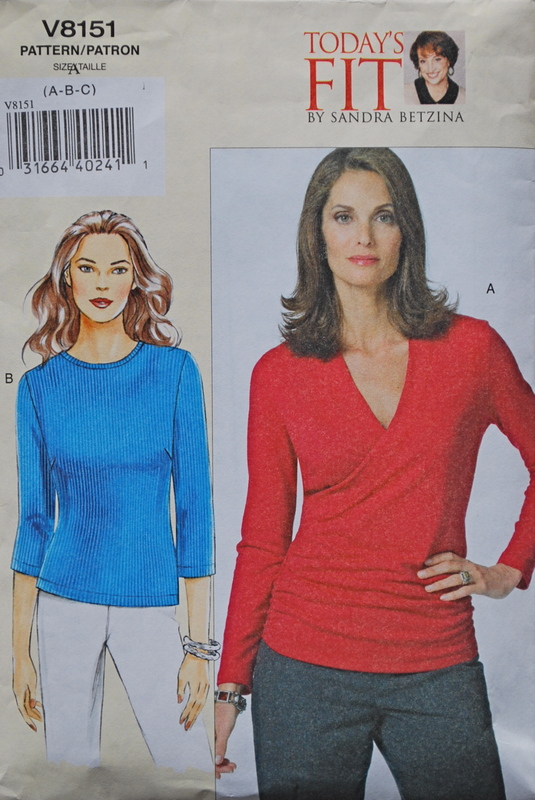 I was initially drawn to this pattern for it’s potentially figure flattering variation of a basic knit top. 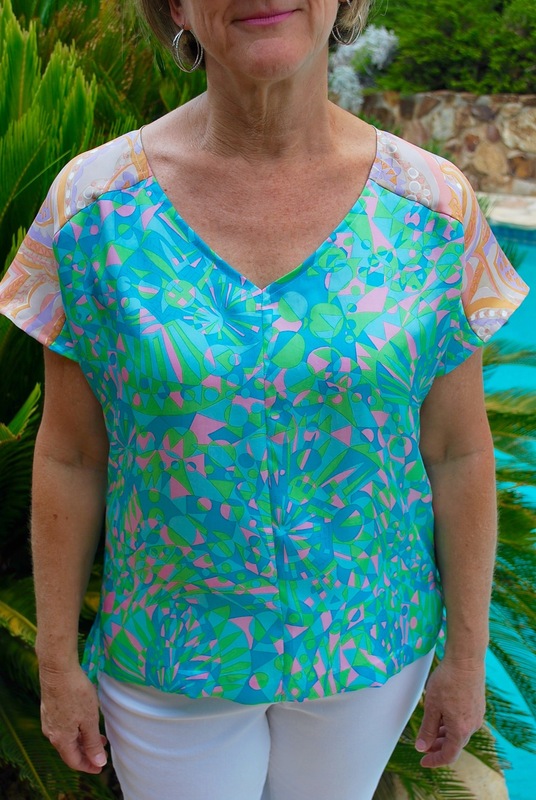 My first version of The Everywoman Top, Vogue 8151, was a fit fail from the waist down. The biggest fit fail of my 25 Fresh Makes. I describe this all in my original post, but basically the fabric was too thick and the fit was too loose, resulting in one big belly sag instead of flattering, fabric folds created by the side ruching. BUT I loved the fit from the waist up. 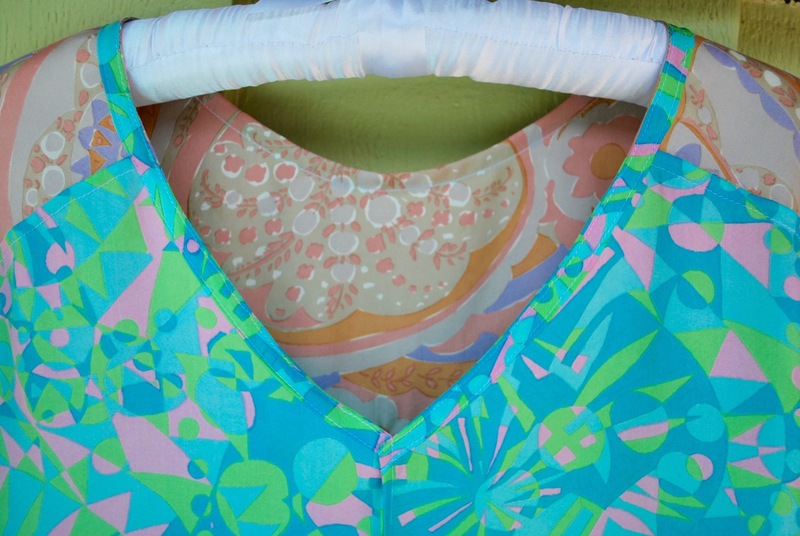 The small bust adjustment I did worked well and neck band laid perfectly in front and back. Through the waist and belly, it’s a bit of a blob silhouette. Go ahead and click to enlarge to see what I mean. There seems to be a lot of prolific sewists in the online sewing community who post new versions of the same pattern frequently. I know it makes sense to perfect a pattern that really fits your lifestyle and can potentially become an integral part of your wardrobe. I just don’t like repetitive sewing. It becomes labor to me rather than a creative experience. What about you? 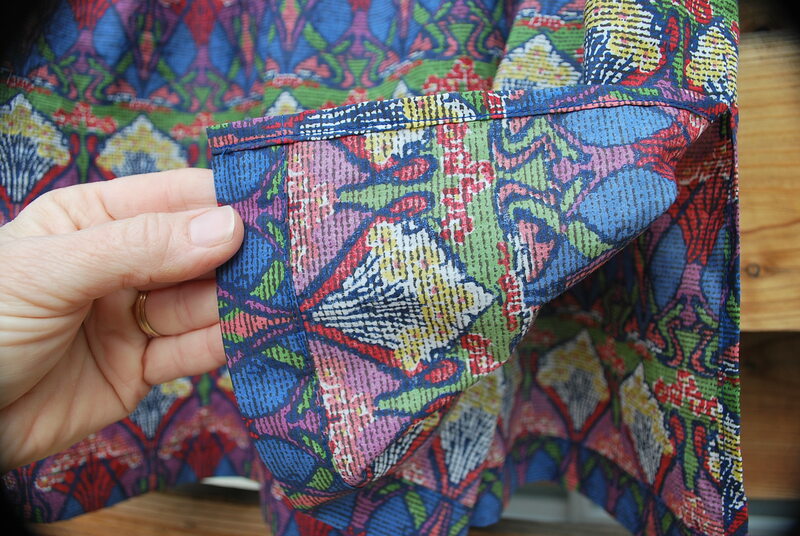 What are your thoughts and practices when it comes to sewing up the same pattern several times? I waited for months for the weather to change, and then when it finally did I realized I had quite a shortage of professional, casual clothes for cooler temperatures. You know the category – not jeans and hoodies, and also not dress slacks and blazers. These are the clothes I need to wear to my teaching job every weekday morning. 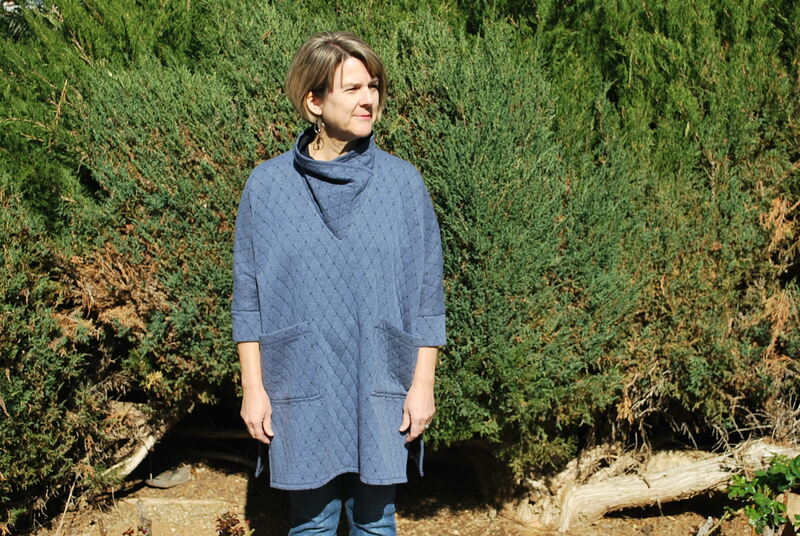 So I choose to make this long sleeve, knit, wrap top for Fresh Make #21, not to wow you with my sewing skills (which I confess is sometimes how choose my makes), but because it is a garment that I truly need. 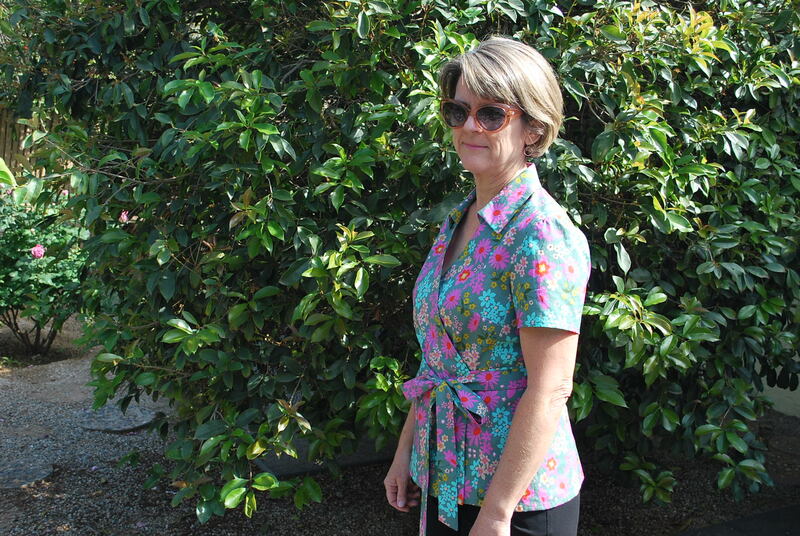 The neckband lays beautifully in the back. 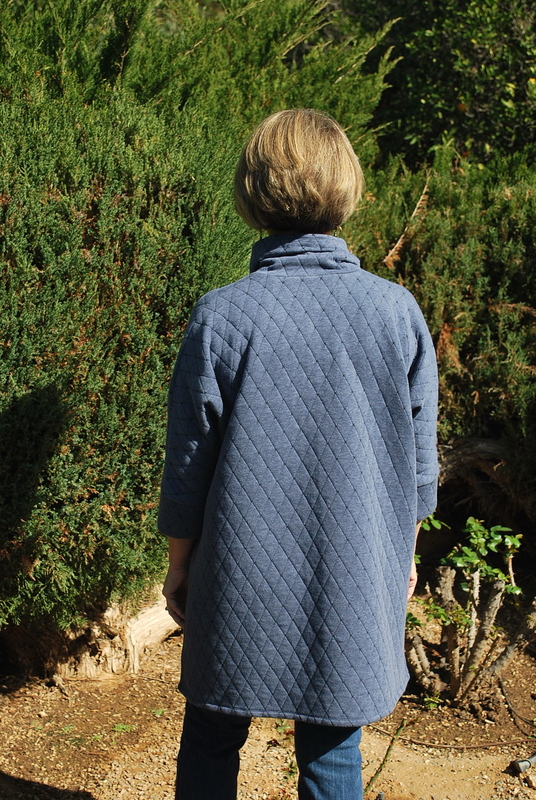 The gathers formed by the side shirring are more successful in the back because of the single layer of fabric. 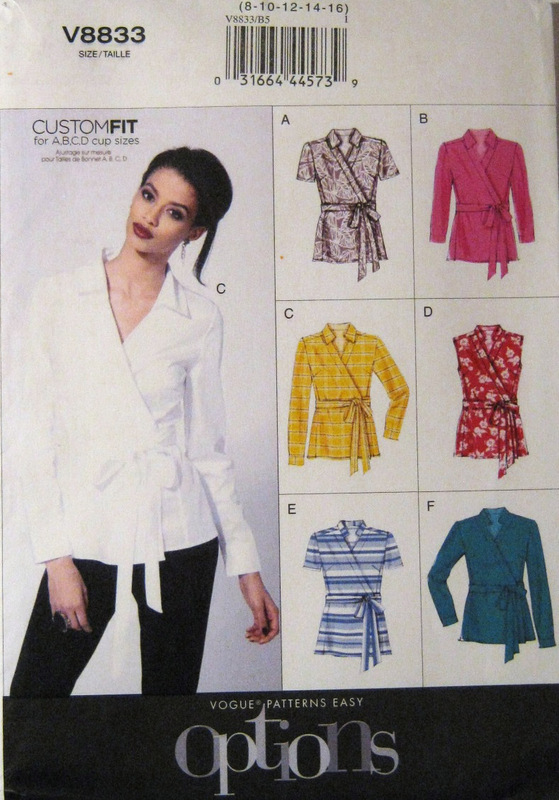 The pattern I choose is Vogue 8151. I bought it on sale at JoAnn’s for $4.99. I’ve been trying to make a commitment to making my own basics. 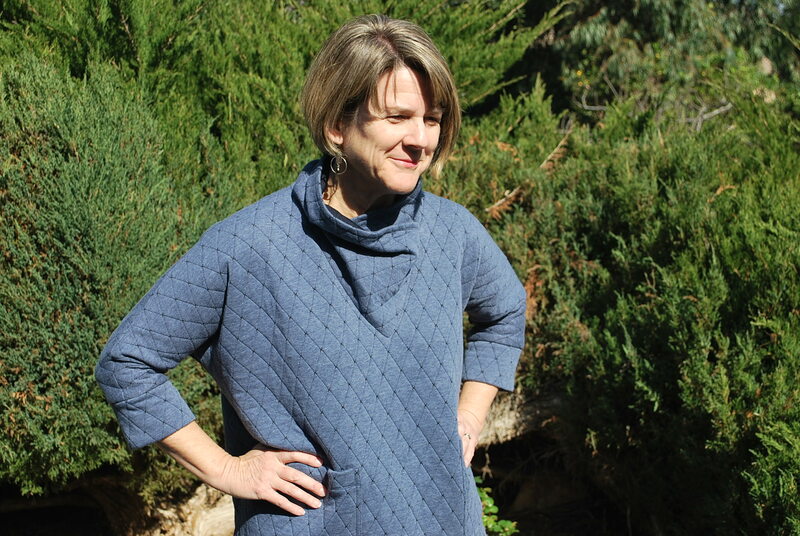 I was attracted to this pattern because the wrap front offers a nice variation on a basic knit top. I was also curious about “Today’s Fit” by Sandra Betzina. The sizing on “Today’s Fit” patterns have a bust/waist/hip ratio more in line with the measurements of real women. I noticed that it was copywrited in 2005, so this pattern has some staying power in the Vogue book. I named it The Every Woman Top because it was designed for all of us. 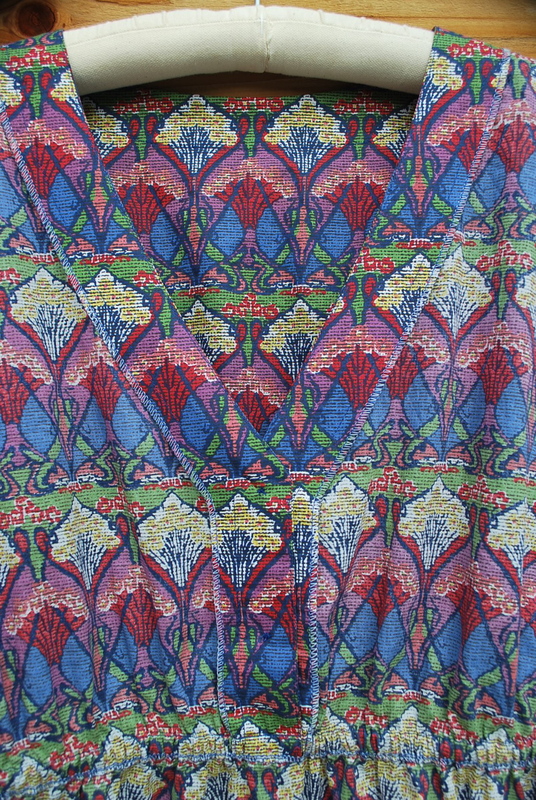 I originally purchased this fabric with the intention of making an easy wearing, short sleeved dress. But the weather turned cooler, and another warm weather dress was not what I needed at the moment. I bought this fabric because I was anxious to try an Amy Butler knit as I know hers is a name I could trust for quality fabrics. There are a lot of bad knits out there. 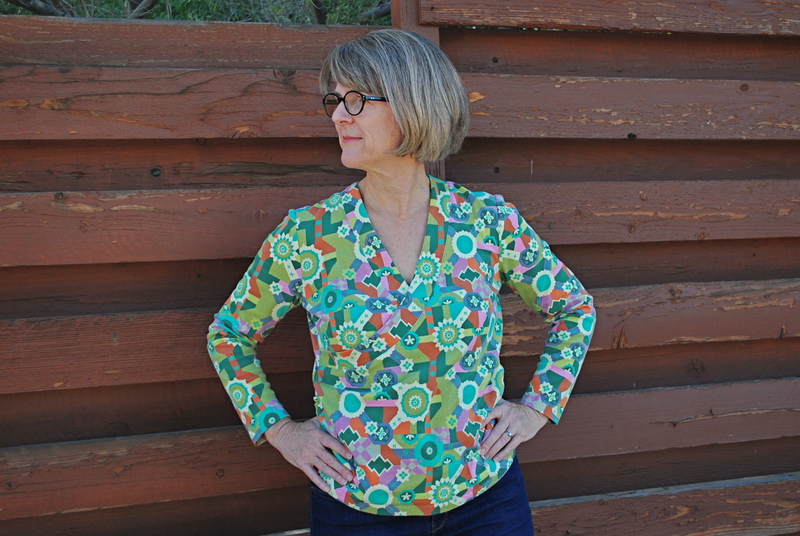 This cotton interlock is Cross Roads in Citrus from Amy Butler’s Glow collection. The weight is substantial and it feels as soft as a favorite pair of PJs. 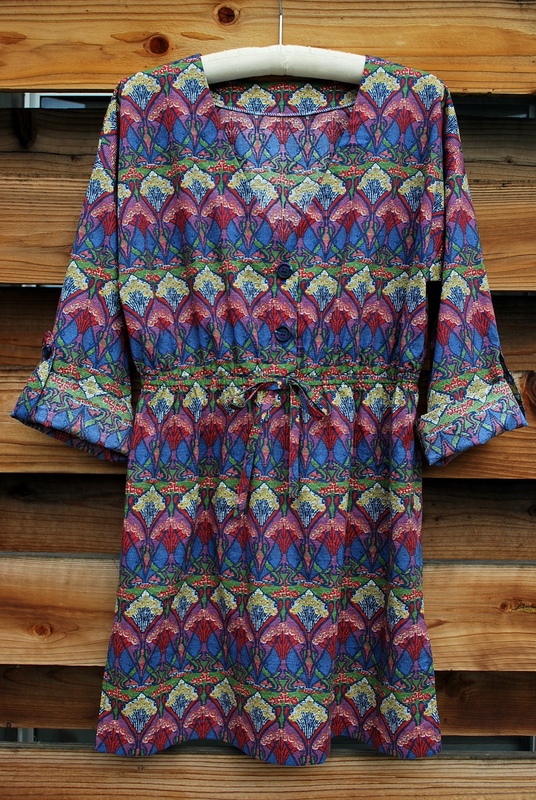 I purchased it from my favorite online fabric store, Hawthorne Threads. I purchase 2 yards at $14.50 per yard, plus tax and shipping. Not cheap but well worth it, I think. I love the neckline on this top. I usually do not look good in a wrap neckline because of my small bust, but this it cut just right for me. 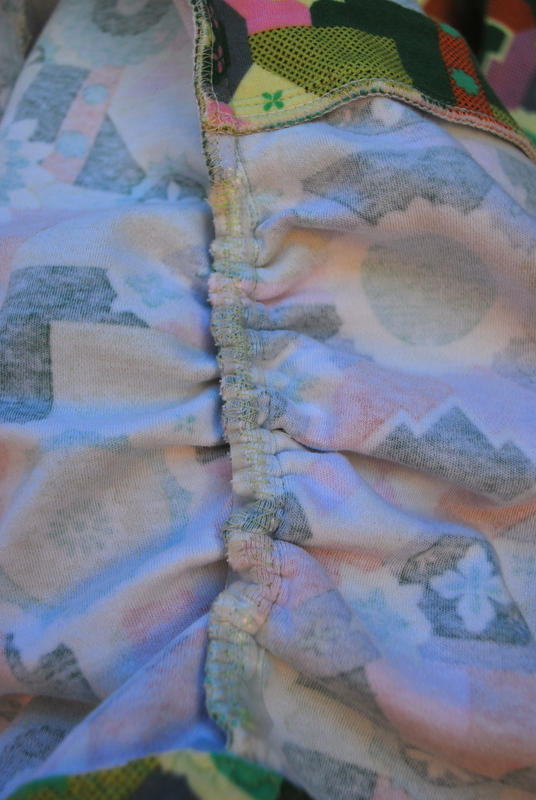 I used clear elastic for the shirring on the sides. 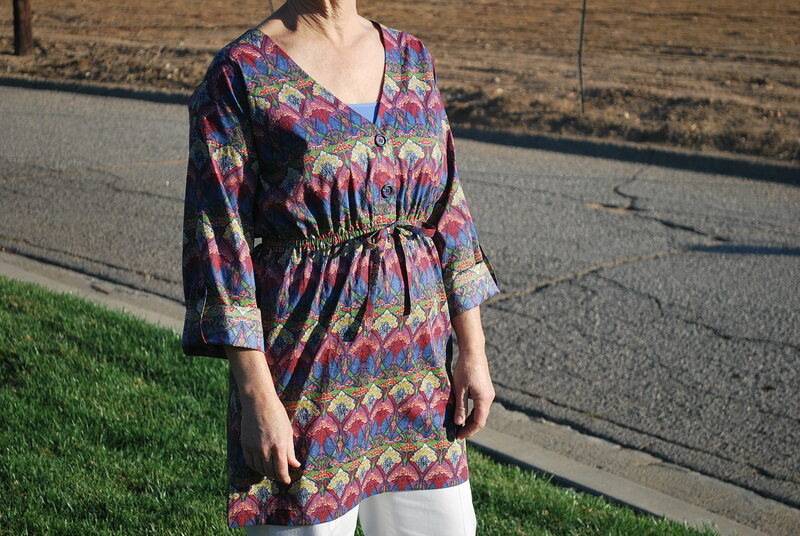 I first used this elastic on my Moneta Dress. 1. I cut a size C. The sizes range from A to J. The measurements on size C are: bust – 36″, waist – 28 1/2″, hips – 38 1/2.” I still have a pear shape even with these adjusted ratios. 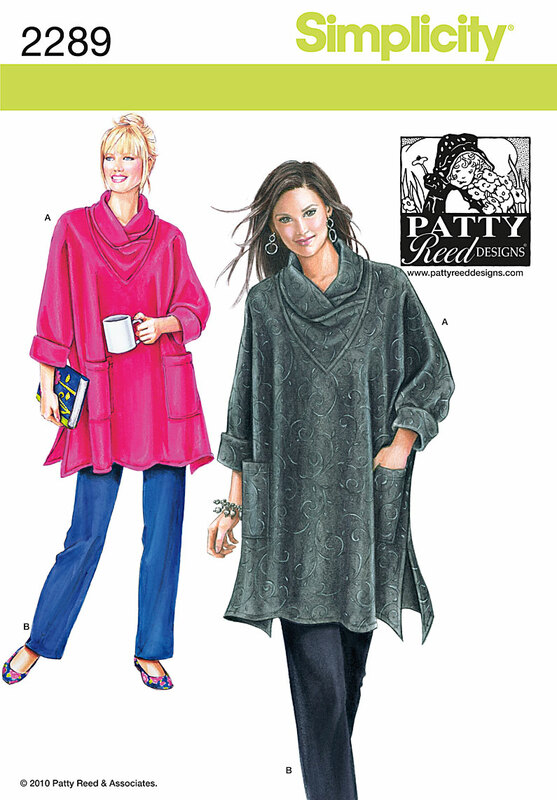 The pattern offered simple adjustment instructions for different body types. I followed the small bust adjustment and folded out 1/2″ through the middle of the dart to reduce dart width. 2. I followed the instructions by looking at the illustrations (which is what I usually do, unless the picture is confusing, then I read.) When I did my first try on, it felt a little too roomy, and I honestly felt I cut the right size for me. So I did a gradual take in on the sides from the armhole through the bust and waist and gradually came back out near the hip. 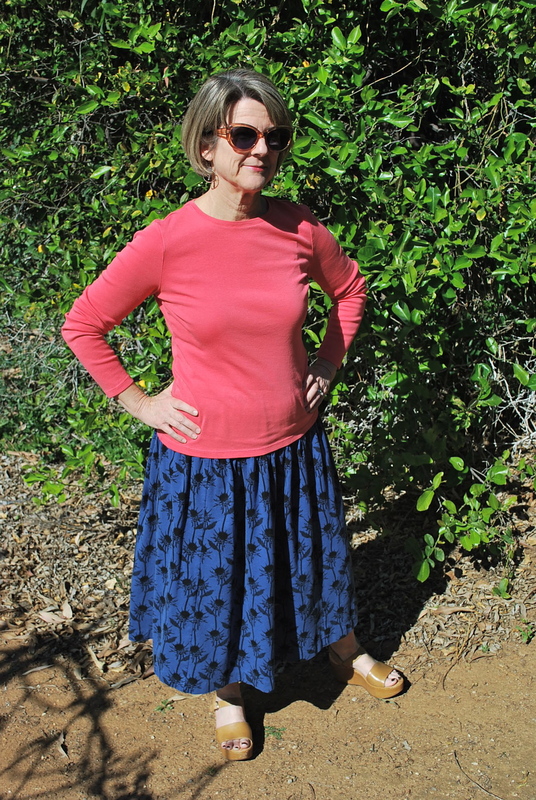 Just today, when I glanced over the pattern, before writing this post, I noticed the instructions says to sew a 1″ seam down the sleeve and sides, then adjust if necessary depending on the stretch of your knit. Ah, that’s why it was big, I had stitched a standard 5/8″ seam! Oh well, next time. 3. While I love this fabric, I don’t think it’s a perfect choice for this pattern. 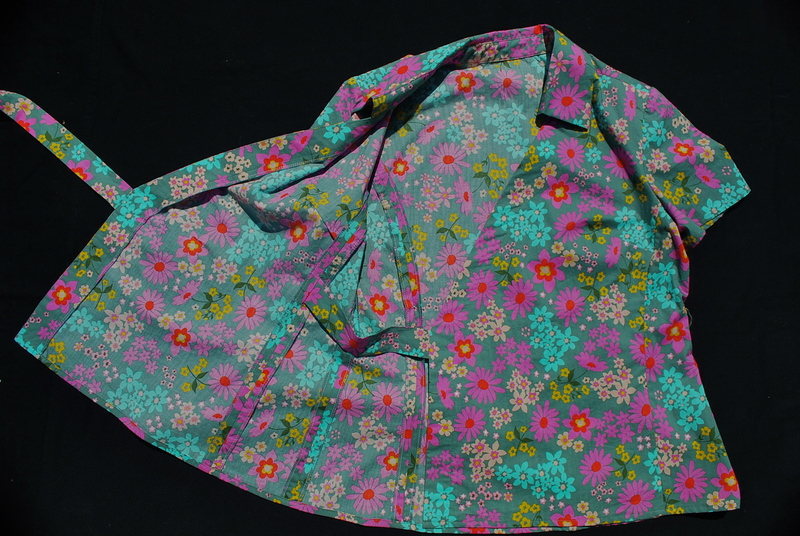 Aside from the fact that the top should just fit me more snugly, I think the shirring at the bottom would form nicer folds with a thinner fabric such as a single jersey knit. 4. I shortened the sleeve by 1″ before cutting.